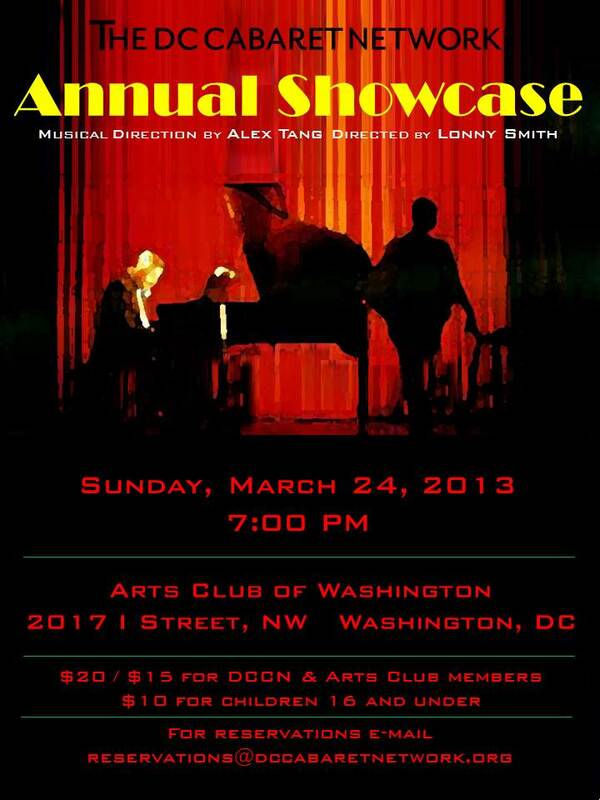 DC Cabaret Network Member Showcase Coming Up on March 24, 2013! March is Cabaret Month and the DC Cabaret Network is delighted to present the ANNUAL MEMBERS ONLY SHOWCASE to be staged at the Arts Club of Washington. Music Direction by Alex Tang, Stage Direction by Lonny Smith and Production by Dorian Woodruff. The Arts Club is located at 2017 I Street, NW in Washington, D.C., near Farragut West and Foggy Bottom Metro stations. Please join the DC Cabaret Network for its monthly open mic night on Wednesday, March 13, 2013, at the Black Fox Lounge. Mary Sugar will be our music director for the evening. The DC Cabaret Network newsletter for March is now available on our homepage. News about upcoming performances by members of the DC Cabaret Network, our Members Only Showcase, our monthly open mic night — plus much more!